“Most Likely to…” is a game designed to have your guests make fun guesses about the bride and groom or the entire guest list. The object of the game is to offer a hypothetical situation and have your guests pick who they think is the most likely person to have that happen to them. For example, you can ask “who is more likely to burn the house down cooking dinner?” and your guests can answer either the bride or the groom. These questions can be as tame, funny, or risqué as you like, depending on the crowd, and it is more fun if you tailor them specifically to the guests in attendance. Another classic game played by teenagers for generations, “Never Have I Ever…” requires each player to state something they have never done, and the other guests receive points or must perform some kind of stunt if they have done it. For example, one person could say “never have I ever caught the bouquet at a wedding,” and anyone who has caught a bouquet gets a point. You can have your guests perform a wide variety of stunts as they are called out on their past experiences, which is a great ice-breaker for friend groups and families who don’t know each other well. Wedding bingo requires a bit of planning, but it can be extremely fun and funny when done correctly. There are a couple different variations to this game, so feel free to make it your own. To start, you must create a variety of bingo cards, each with different descriptions of people on your guest list. For example, you can include something like “Bride’s childhood friend,” “Groom’s college roommate,” or “couple married for more than ten years,” and your guests must seek out the people on their card to fill the space. As guests arrive, they must mingle with each other to find people who fill out their bingo card. Another classic kid’s game that works well at weddings is “I-Spy.” This simple game only requires you to make a list of things that your guests must see and take a picture of to cross off their list. You can have each table competing to complete their list first, which is a great way to have your guests socialize through some friendly competition. For even better results, make it a list of things you want to remember from the wedding and all of your guests will take pictures of these things. Some examples include the first dance, the father/daughter dance, a group shot of your table, or a shot of your whole table dancing. Feel free to make it your own. At the end of the event, give the team who completes their sheet a prize, and collect all of the photos so you have a selection of candid shots to remember your special day. “Bride and Groom Trivia” is a simple game that requires you to make a list of random facts and questions about the bride and groom and have your guests try to answer them. 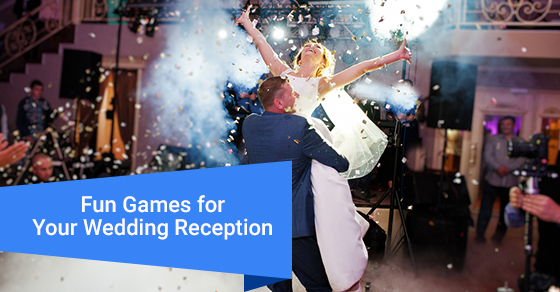 You can include fun facts about your relationship like “Where was the bride and groom’s first date?” or opt for individual questions like “Who was the groom’s childhood hero?” This game is a great way to help your guests get to know the happy couple. Once again, prizes can be awarded to the winners for an extra incentive. One of the more creative ideas is a custom game of “Guess Who” designed with the faces of your guests. This is a fun and easy way for guests to get to know other guests at the wedding. Simply cut out a picture of your guests and frame them on a homemade version of the classic game. Each player picks a secret guest, and the other players take turns trying to guess who it is by eliminating other options. For example, a guest can ask “Does your personal have blonde hair?” or “Does your person wear glasses?” which can help them narrow down their choice. Another fun twist on a classic game is for you to create custom Mad Libs for your guests to fill in. Feel free to get creative and make a fun scenario tailored to the bride and groom or to your guests. The guests fill in the blanks of the scenario with nouns, verbs, and adjectives to create funny, spontaneous stories that can then be shared with the bride and groom or with the whole group. Whoever makes the funniest Mad Lib wins a prize. Finally, one of the most popular events at any wedding: dance battles. Nothing offers more fun and enthusiasm at a wedding than getting all of your guests up on the dance floor. Head-to-head dance battles are a blast with a band or DJ. As another alternative, you can organize each table to participate in a “pop n’ lock” competition where each table must always have someone dancing. This fun event helps get everyone out of their shell and involved in the activities, which is more fun for everyone. Wedding receptions are much more fun when you have the space to accommodate all of your guests comfortably. It is even more fun when you have the space to play games. At Chateau Le Jardin, we have one of the most gorgeous reception halls in Vaughan, and we can tailor our services to accommodate all of your wedding needs.